April is winding down, but before it ends, there’s something important we should all talk about. Because April happens to be Heartworm Prevention Month. As Spring brings the heat back to Florida, it also brings one of our most prevalent and annoying pests – the dreaded mosquito. They’re an annoyance to us, but to our pets, they can be something truly dangerous. Heartworm disease can be found in every state in the United States, but it is especially common here in the southern, tropical climate, where mosquitoes thrive. Here, with our warm weather, “heartworm season” is actually year-round. It is estimated that each year about one million dogs are found to be heartworm positive! Heartworm disease is spread when a mosquito bites an animal with a heartworm infection, taking in young worms through the blood. These young worms mature for a couple weeks inside the mosquito and then can be transferred to your pet through a bite. Over months, these worms migrate through your animal’s bloodstream, growing larger inside them. Initially, there may be no sign that your pet is infected at all, but as the worms grow bigger and breed, and the infection spreads, the effects can become severe. The symptoms of a dangerous heartworm infection can include coughing, difficulty breathing, fatigue, abnormal noise in the lungs or heart, enlargement of the liver, ascites, and eventually, death. Dogs are the most common victims of heartworm infection. Cats have a natural resistance to them, but they are by no means immune. It’s estimated that for every 100 infections in dogs, there may be 10 infections in cats. Unfortunately, the symptoms in cats can be more subtle so it is often more difficult to diagnose. All pets can potentially be at risk of being infected by heartworms, even indoor pets as it only takes one bite from a mosquito to spread the infection! It all sounds very scary, but luckily, heartworm disease is very preventable, thanks to regular preventive medicine that is safe, easy and inexpensive. 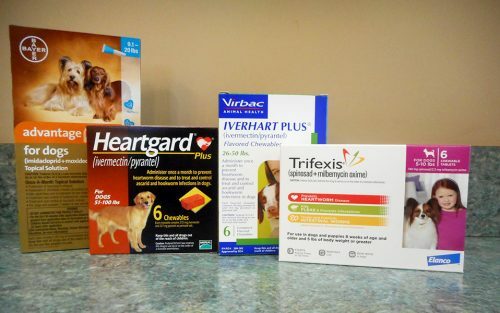 Here at Park Avenue, we have you covered with Heartgard and Iverhart, which cover heartworms and intestinal parasites. We also have Trifexis and Advantage Multi which do heartworms, intestinal parasites and fleas. Don’t wait until next April. Get your pet protected now!